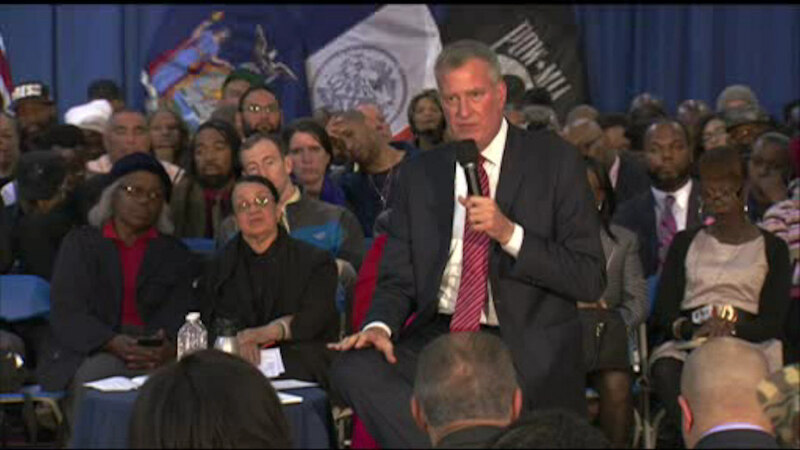 BRONX, New York (WABC) -- In his first Bronx town hall meeting on Tuesday, Mayor Bill de Blasio faced residents with public safety concerns and a number of other issues happening in the borough. Held at the Claremont Neighborhood Center with a few hundred people in attendance, Mayor de Blasio spoke and answered questions for just over two hours. With the NYPD becoming more proactive in gang takedowns, he described the number of them in the Bronx since last year as making a huge difference. "We can pinpoint folks who create most of the pain and do more and that's why these takedowns are so crucial," said Mayor de Blasio. "It's a long road and I feel each time that we lose someone, but I can say that we're making progress." Community leaders at the town hall stressed that it was important for residents to do their part in helping to keep their neighborhoods safe. Other topics discussed during the forum included public housing, parks, and providing after school programs for kids. Mayor de Blasio was joined by several city officials, including Bronx District Attorney Darcel Clark, and City Council Members Vanessa Gibson and Rafael Salamanca Jr.